Euston was the first inter-city railway station in central London, opened on 20 July 1837 as the terminus of the London and Birmingham Railway. The site was selected in the early 1830s by George and Robert Stephenson, engineers of the London and Birmingham Railway. The area was then mostly farmland at the edge of the expanding city of London. The station was named after Euston Hall in Suffolk, the ancestral home of the Dukes of Grafton, who were the main landowners in the area. Before Euston was built the trains from Birmingham had an unsatisfactory endpoint at Chalk Farm, built in 1833. 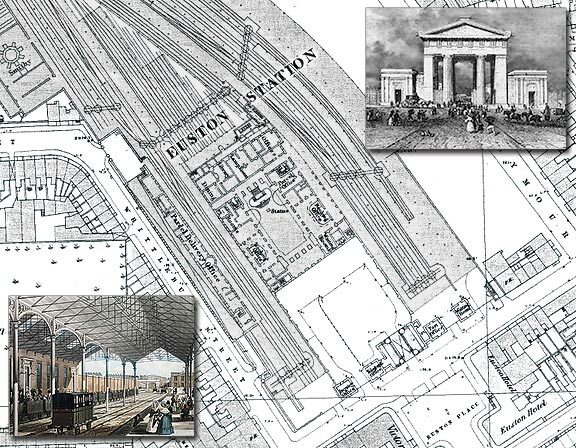 It was George Stephenson who planned the original station at Euston Grove with just two platforms, one for arrivals, one departures, sheltered beneath a massive wrought-iron roof. The building was designed by Philip Hardwick, fronted by a 72’ high porticot. This portico acquired the name Euston Arch. There was a notable engineering oddity about Euston from its opening on July 20 1837: because Lord Southampton, master of the Quorn Hunt, Conservative grandee, and a major landowner locally, objected to the potential noise and dirt, no locomotives were allowed between Euston and Camden Town. Instead trains were pulled from the terminus to Camden by a cable device until 1844, when engines were at last allowed. The station grew rapidly over the following years as traffic increased. It was greatly expanded in the 1840s, with the opening in 1849 of the spectacular Great Hall, designed by Hardwick’s son Philip Charles Hardwick in classical style. It was 126 ft long, 61 ft wide and 64 ft high, with a coffered ceiling and a sweeping double flight of stairs leading to offices at its northern end. The pioneers who established the railway network built Euston Arch, the massive Doric portico, outside the first terminus in London, Euston Station; in the 1960s their ancestors knocked it down in what many consider to be an act of cultural vandalism. Perhaps there is hope for this generation as a campaign now exists to have the Euston Arch restored. If you have an interesting story and would like to see a historical map of your area then why not let us know by emailing us.